Sewing patchwork by hand adds a personal touch to your work. 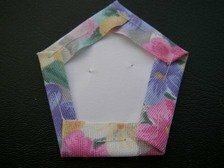 Sewing patchwork by hand can join small pieces of fabric together, in either squares, rectangles, hexagons or any shape you would like to do, to make a larger piece of patterned fabric. Patchwork sewn by machine can be done for larger items using regular shapes but sometimes if the shape is a little more intricate, like a pentagon, then hand sewing is sometimes the best way to sew. Years ago sewing patchwork by hand was the only way a person or in some cases a group of people would have been able to make a quilt or a cushion cover. But with the invention of the sewing machine this has been made easier. However the art of hand sewn patchwork can be relaxing and very rewarding when the sewn item is finished. The design of the patchwork pattern can be worked out on graph paper using different colours to represent the material you have. This can be entirely your own ideas or there are a lot of books showing different types of patterns. Also kits can be bought with everything already cut out for you. 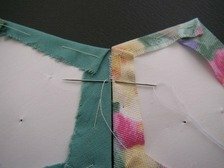 Below are steps of joining pieces of fabric together in a basic freehand patchwork pattern. The fabric that can be used for this is really any type but the same type and weight should be used throughout. If a mixture was used, i.e. lightweight cotton with corduroy, then the wear of the item would probably not be even. But the choice is up to you and if the item you are making is small, like a pincushion, then sometimes a mixture of materials wouldn't really matter. If the fabric is new washing it is best to wash it first in case it shrinks. 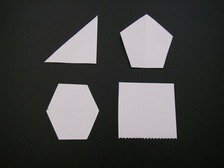 Decide the shape you want to use and make templates in this shape out of strong card or recycle any cardboard you may have, adding 1/4" (6mm) seam allowance to all sides. You will need as many templates as there are sections to your cushion cover as these templates also act as a support structure while sewing. Place the templates on the wrong side of the fabric allowing a 1/4" (6mm) seam allowance and draw around template. Cut out as many of each colour or pattern as required. Place template in middle of the material shape making sure it is following the straight grain of the material. Attach securely with a pin. Carefully fold the material over the edge of the template taking care at each corner. Tack the material onto the template. Iron ready to join together. 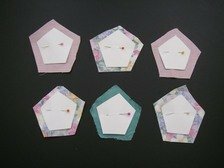 Take two material templates or patches with the right sides facing down and one edge together. Sew with small overcast stitches catching the material but not the cardboard template. Secure the thread at the start and finish of the edge. Continue joining the patches using small overcast stitches on one or more edges until the cover is finished. Remove the tacking threads and the cardboard templates, iron the seam allowances in place, sometimes it help to sew a lining inside the patchwork cover so that the edges are hidden. 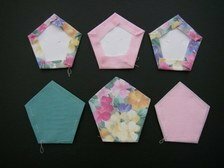 Sewing this patchwork by hand in a pentagon shape is especially good for making pincushions and by joining more edges together it can be turned into a ball shape to make a lavender bag. After following these steps you can now take your sewing wherever you go with no need for a machine. Why not show your work on my cushion gallery.